The 1908 New York state election was held on November 3, 1908, to elect the Governor, the Lieutenant Governor, the Secretary of State, the State Comptroller, the Attorney General, the State Treasurer, the State Engineer and a judge of the New York Court of Appeals, as well as all members of the New York State Assembly and the New York State Senate. The Prohibition state convention met on September 2 at Syracuse, New York. Rev. Dr. George E. Stockwell, of Fort Plain, was nominated for governor on the first ballot (vote: Stockwell 232, Hudson 219). The defeated contender, Marshall A. Hudson, of Syracuse, was nominated for lieutenant governor. The convention also nominated Edgar T. Welch, of Westfield, for secretary of state; Harrison L. Hoyt, of Auburn, for comptroller; William T. Richardson, of Wellsville, for treasurer; W. F. L. Manierre, of New York City, for attorney general; and Albert W. Pierson, of Niagara Falls, for state engineer. Welch declined to run, and the Prohibition State Executive Committee met on September 23 at Syracuse and substituted James C. Crawford, of Mount Vernon, on the ticket. They also nominated Coleridge A. Hart for the Court of Appeals. The Republican state convention met on September 14 and 15 at Convention Hall in Saratoga, New York. U.S. Secretary of State Elihu Root was Temporary and Permanent Chairman. Governor Charles E. Hughes was re-nominated on the first ballot (the other candidates were Speaker James W. Wadsworth, Jr. and John Knox Stewart). White, Gaus, O'Malley, Williams and Haight were nominated unopposed. Samuel S. Koenig defeated William O. Barnes, of Rensselaer County, for secretary of state; and Thomas B. Dunn defeated H. Homer Moore, of Queens, for treasurer. The Democratic state convention met on September 15 and 16 at Rochester, New York. Denis O'Brien was Temporary Chairman until the choice of Alton B. Parker as Permanent Chairman. The incumbent Lt. Gov. Lewis S. Chanler was nominated for governor. The incumbents Whalen, Glynn, Hauser and Republican judge Haight were re-nominated. John Alden Dix was nominated for lieutenant governor, and George M. Palmer for attorney general; all these nominations were made by acclamation. The only contest happened at the nomination for state engineer. Philip P. Farley was nominated on the first ballot (vote: Farley 321, Leonard C. L. Smith 97). The Independence League state convention met on September 24 at Cooper Union in New York City. James A. Allen was Temporary and Permanent Chairman. State Chairman William Randolph Hearst assailed in a speech Democrats, Republicans, and the big corporations. 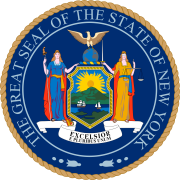 They nominated by acclamation Clarence J. Shearn for governor; Dr. Daniel W. Finnimore, of Potsdam, for lieutenant governor; Frank H. Stevens, a labor union man of Nassau County, for secretary of state; Willard H. Glen, a lawyer of Syracuse, for comptroller; William I. Sirovich for treasurer; Assistant Attorney General William A. De Ford for attorney general; M. J. Cafiero, of Brooklyn, for state engineer; Reuben Robie Lyon for the Court of Appeals. ^ Clarence J. Shearn, of New York City, Hearst's personal attorney, former reporter for The New York Times, ran with mayoral candidate Hearst on the Municipal Ownership ticket in 1905 for D.A.